Amin- Passed Graduation in Amanat or ITI Certificate in Surveyor Trade. Survey Clerk- Passed Graduation in any Discipline. Sahayak Bandobast Adhikari/Kanoongo- Passed Diploma in Civil Engineering Discipline from any Recognized Institution and 2 Year Work Experience in similar Field. 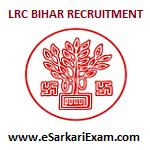 Eligible Candidates can Submit LRC Amin, Clerk, Kanoongo 2019 Online Application at the Official Website of LRC Bihar Latest by 1st April 2019. Applicants First Open LRC Bihar Official Website. Open Bihar Special Survey Recruitment Link. Open 02 to 05/2019 View Advertisement Link. Pay Application Fee and Upload Scan Photograph and Signature and Required Documents.